Aaron Lynch has nine sacks in his last 14 games. Not much has gone right for the San Francisco 49ers since a season-opening victory over Minnesota. 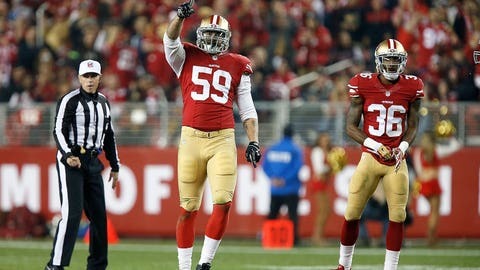 One of the bright spots, though, has been the play of second-year linebacker Aaron Lynch, who is coming off his best game of the young season in last week’s 17-3 home loss to the Green Bay Packers. #49ers DC Eric Mangini on Aaron Lynch: "Aaron is a good player. He's really talented. Tough. Smart. Has a high motor." Lynch took down Packers quarterback Aaron Rodgers twice in the game, giving him nine sacks for his brief career – all coming in the last 14 games. The second-year University of South Florida product has seven tackles for losses in four games to rank third in the league behind Houston’s J.J. Watt and St. Louis’ Aaron Donald.